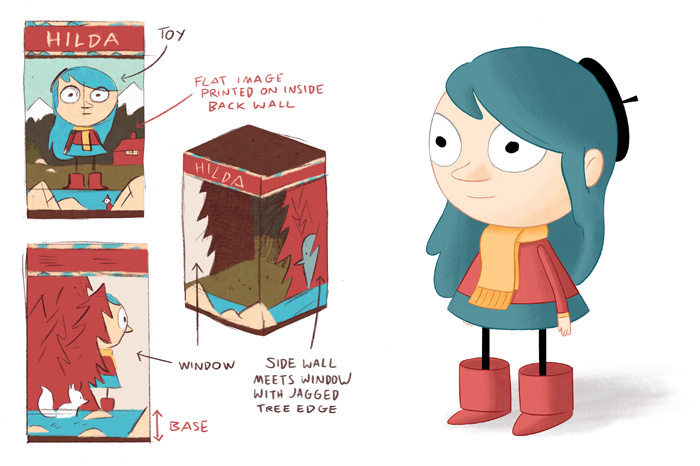 It’s no secret that this little girl has been making waves since Luke Pearson penned her first adventure Hildafolk in 2010, and now we are very proud to announce that you can recreate the moss-loving, troll-befriending Hilda’s escapades at home with this glorious, magnificent Hildafolk Vinyl Art Toy! At 8 inches high she’s the perfect size to act as a desktop buddy, or to adorn the shelves of your carefully curated vinyl toy cabinet. Better yet, she has positionable hands and is safety-tested for ages 7 and up, so if your little ‘uns have become a fan of her magical adventures they can play with her (provided they are 7+) without a worry in the world! The best news? We are giving you a pre-order early bird offer of £34.99 for this beautiful vinyl toy for just two weeks! You can get a whole £10 off the RRP of £44.99 if you order between Wednesday the 7th and Wednesday the 21st of November! EU customers also benefit from a big discount in this period from a list price of 56€ to the discount price of 43€. This pre-order will ship on the 21st of December 2012, so unfortunately we can not guarantee pre-Christmas delivery. So what are you waiting for? 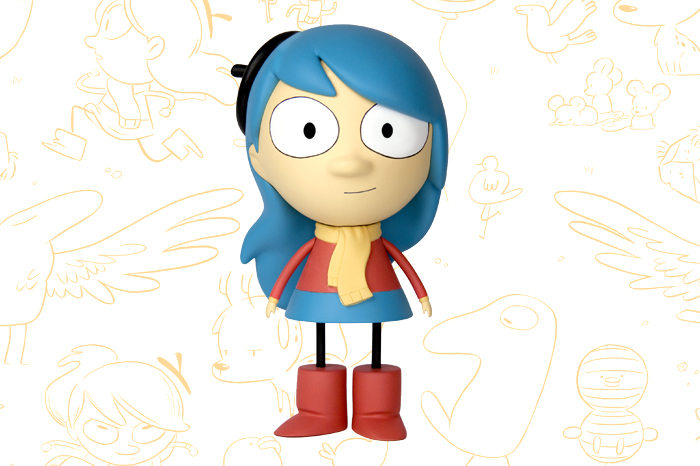 Get your Hildafolk Vinyl Art Toy at a great deal now while stocks last! Below is some prototype artwork from the early design stages of the toy. 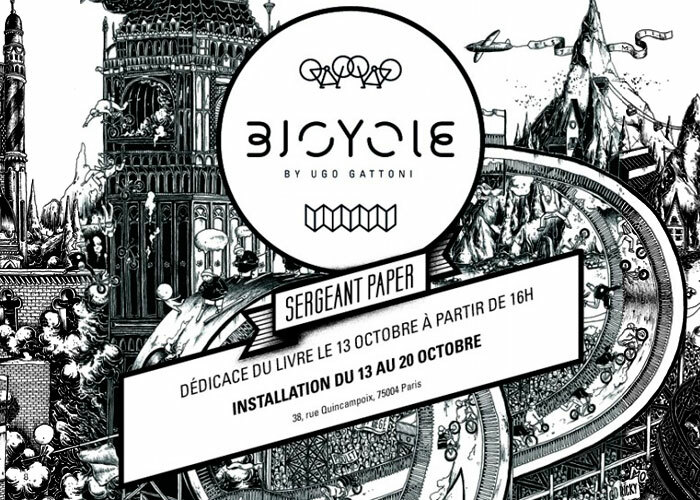 This Saturday, October 13th Ugo Gattoni, creator of the intricately constructed Savador Dali-meets-Where’s Wally-at-the-Olympics concertina Bicycle, will be signing copies of his work at the Sergeant Paper art shop in Paris. If you’re in the city of lights, why not cycle down? 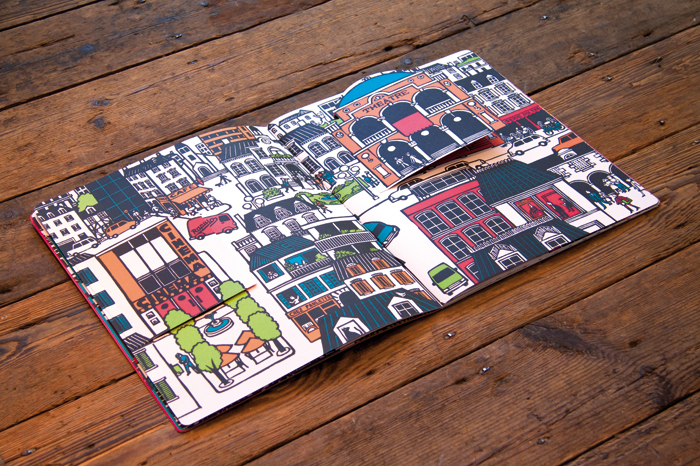 Bicycle will also be the subject of an in-store exhibition until October 20th and Sergeant Paper are releasing a series of 50 signed, limited edition 54x95cm panorama prints from the Leporello book. So even if you miss the man himself, there’s plenty to make the detour for. It’s about time for a post about SPX! 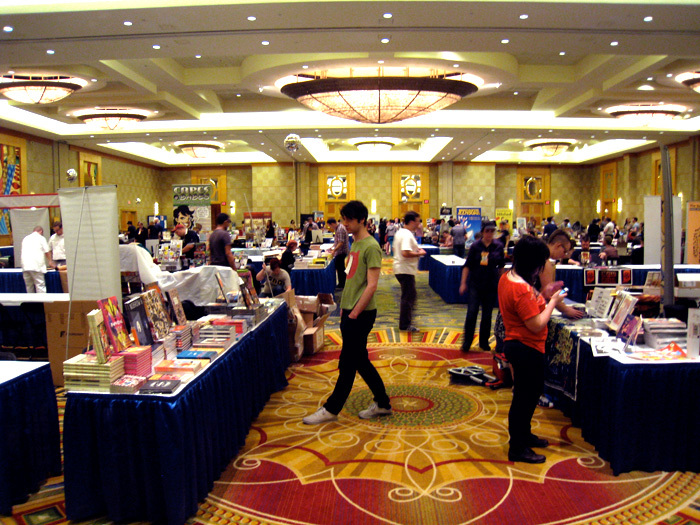 Finally I have time to write this long-overdue post about the fantastic SPX (Small Press EXpo) in Washington DC, USA. A big thank you has to go out to the brilliant Warren Bernard and the rest of the wonderful people at SPX for inviting us over in the first place. Luke Pearson and I had a great time and sold hundreds of books to an eager crowd of super enthusiastic alternative comics fans. As comics festivals go this has to rank as one of the best in the world – check out the website and you’ll see what a stellar line up of guests they had. For anyone on this side of the pond thinking of taking a comics related trip to the USA, definitely plan your itinerary around being in DC for this event next year – you wont be disappointed! After hitting the tarmac at Dulles International Airport Luke and I headed straight for a bite to eat. We chose a place in the mall round the corner from the hotel where the event takes place. Having consumed over 2000 calories each (we know this as the calories per meal were listed on the menu… handy info!) we felt we were set up for a day of sight seeing before manning our stand at the festival. I have to say I do love Americans – in my 37th year I was IDed five times during our stay… flattery gets you everywhere! Anyway DC has some of the best museums in the world (Smithsonian Space and Flight Museum is awesome) and also a quaint building called the White House… surrounded by police we didn’t get to have tea with the president as we’d hoped… but hey there’s always next year. 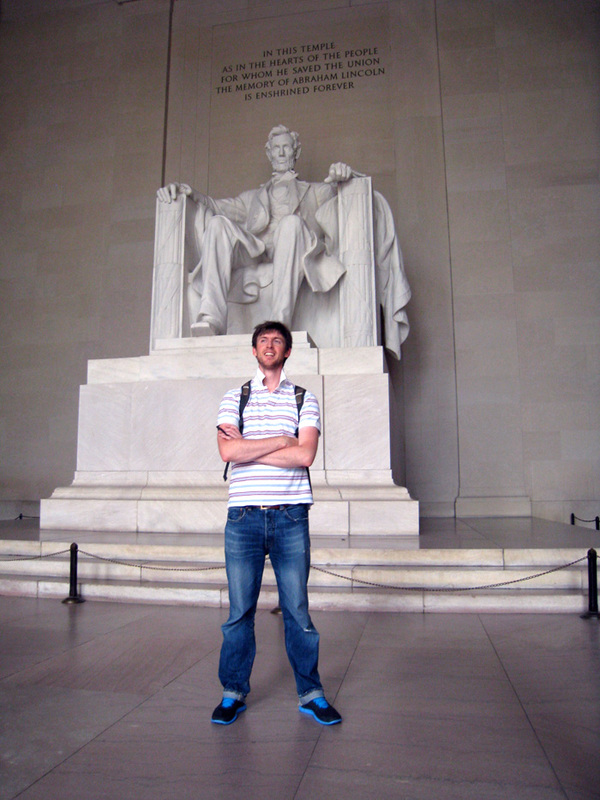 Luke bought a rather fetching plastic bust of Obama at the airport on the way home by way of consolation. 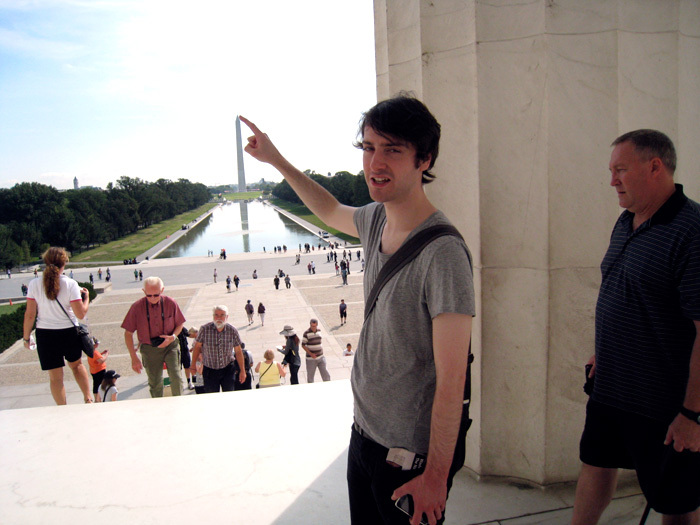 I also have to say that I was more impressed than I thought I’d be at the Lincoln Memorial. The festival itself was the highlight though. We started off the day by sitting in on a panel to discuss the state of British Comics led by the American Culture and Comics critic Rob Clough. Fascinating stuff and it was great to see Nick Abadzis, Glyn Dillon and Ellen Lindner on the panel too. After that I can only describe the following six hours as a frenzy! We immediately sold out of books like Space Race and Dockwood, and everything else wasn’t far behind, by the end of the show we had sold just about everything on the table! One regret would be that I didn’t get to look around quite as much as I’d have liked, but it was great to see the guys from Picturebox – the new Sammy Harkham and Jonny Negron books are the bomb! Always a pleasure to hang out with Chris Pitzer (Adhouse), Annie Koyama (Koyama Press) and Brett Warnock (Top Shelf) – thanks for dinner Annie! (When you come to London you have to let us pay!). After a plate of Peruvian roasted chicken with yucca and rice and beans in a neighbourhood Bethesda eatery with Warren Bernard we headed out for the airport with book-laden suitcases (check our previous post for info on new books picked up at SPX for the shop). Twelve hours later we were bleary eyed (Men in Black III provided my best hope for sleep on the flight, I don’t remember much of it so it must have done it’s job! ), exhausted but exhilarated and finally back in Blighty. 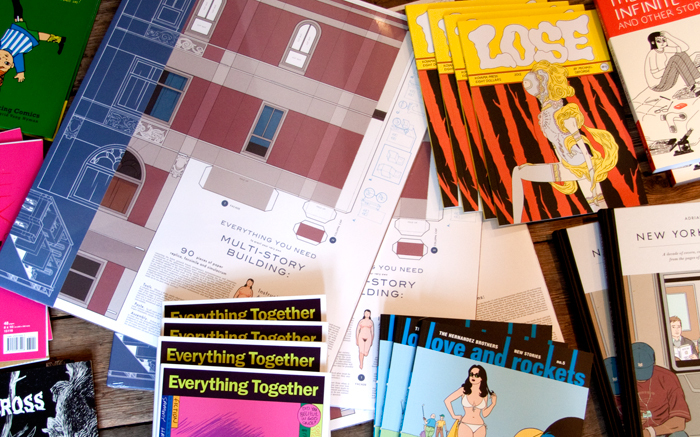 We’ve got new stock from SPX. Sam came back with a stack of great books that you can’t get anywhere else. They all had to be carried across the Atlantic by one man so there aren’t many copies of anything. Get here quickly so you don’t miss out! 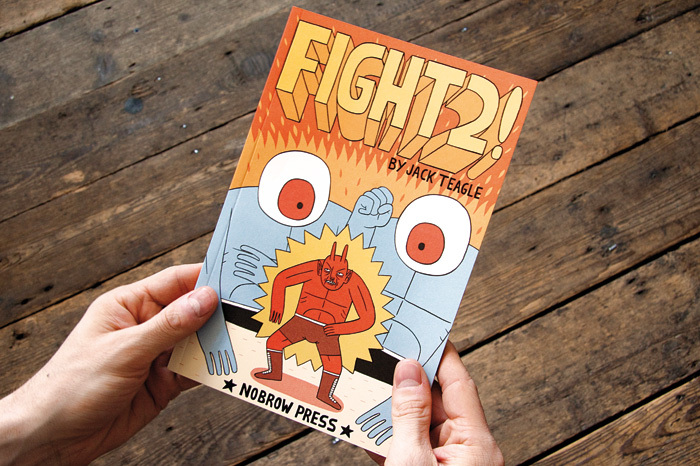 This weekend, Nobrow will be at Kapow! Comic Convention with all our latest and greatest releases. Kapow! is one of the very best mainstream comics conventions in the UK, with all-star special guests like Jonathan Ross and Mark Millar and cosplayers galore, so if you’re at the convention come by and say hi! We’ve just had a massive shipment of beautiful books from Italian publisher, Corraini, including work by Bruno Munari, Taro Miura, William Wondrinska and the incredible Richard McGuire. 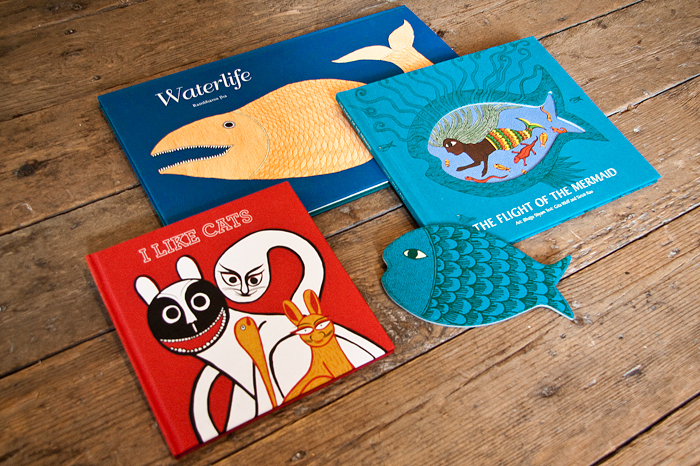 These are some of the most attractive and inventive children’s books ever produced and they make fantastic gifts, so be sure to come by our Great Eastern Street store and check them out as we only have a limited amount in stock! 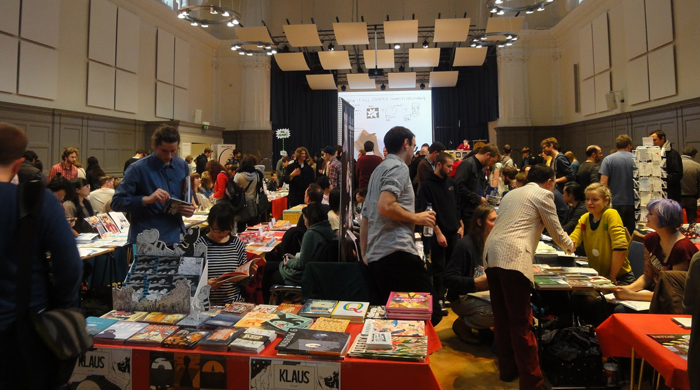 This Saturday, Nobrow will once again be attending the wonderful Comica Comiket at the Bishopsgate Institute in East London. Bringing together some of the best publishers and cartoonists in the UK, this event is not to be missed, particularly as this year we’ll be setting up our very own Nobrow Room full of all our beautiful books. We’ll also have Louis Roskosch, the cartoonist behind the hilarious Adventures of Leeroy and Popo, along to do some live drawing with Tom Gauld and a whole host of other incredible artists. You’d be crazy to miss it! 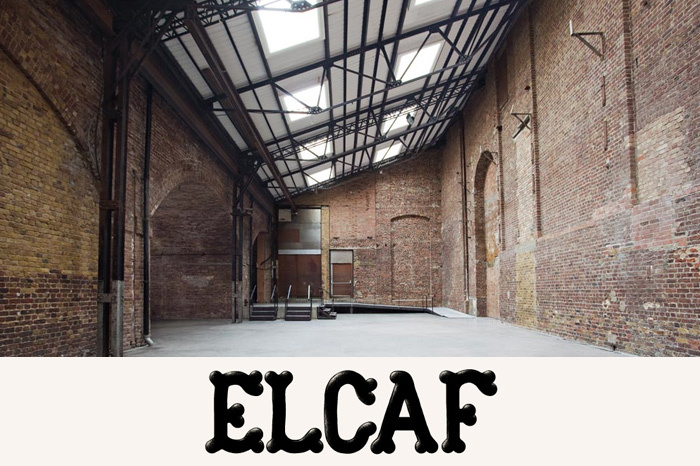 This summer, Nobrow Press is very proud to present ELCAF 2012, the first East London Comics & Arts Festival. On Sunday June 17th, the fantastic Village Underground in London’s Shoreditch will host a day of curated pop-up stalls, talks, live-drawing and music, designed to showcase the very best of the vibrant comics and graphic arts scenes of London, Europe and the rest of the world. It is with this in mind that we ask all you cartoonists, collectives and publishers out there to apply for a stall and get involved in what will be one of the most exciting arts events of the year. You can find our complete submissions guidelines here, but bear in mind that as ELCAF will be a curated event not all applications will be guaranteed a place at the festival. That’s no excuse not to have a go though! The deadline for applications is April 24th. Read More..
Spring is here! Finally the sun is shining, the grass is growing and the books are happy. 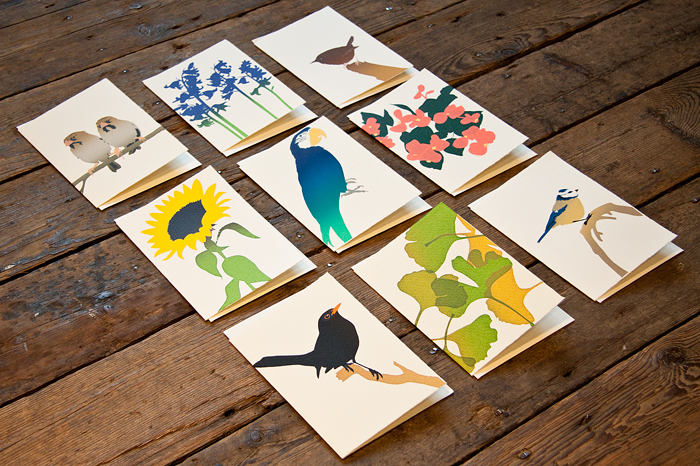 To celebrate the turn of the season, we now have a selection of beautiful, hand-printed greetings cards from the wonderful Jill Green in our Great Eastern Street shop. Perfect for birthdays, thank-yous or even ‘happy spring’ cards, they’re the ideal reason to come in to Nobrow HQ on a sunny afternoon. Three titles from Tara Books just arrived in our shop. These beautiful artisan books from Chennai in South India need to be seen to be believed. Each book has expertly hand made elements. Notice the die cut cover on The Flight of the Mermaid; that fish fits back into the cover like a puzzle piece! Unbelievable. Be sure to come in and have a look while stocks last. We are very excited that on Thursday 29th March stellar cartoonist and all-round nice guy Tom Gauld will be signing and sketching in copies of his recently released graphic novel Goliath right here at Nobrow HQ. He’ll be scribbling away from 6pm ’til 7:30pm, so don’t be late! After the main event, everyone’s welcome to crack open a free brewski, sit back in our newly spruced up shop and enjoy his new tome surrounded by beautiful books. See you there! 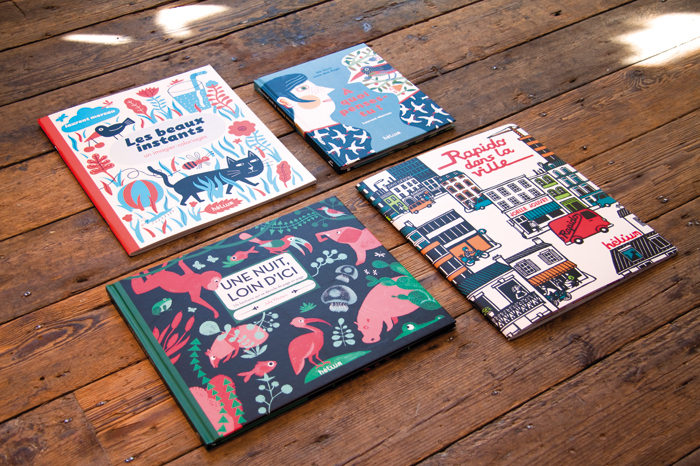 French publisher hélium editions produces some of the finest children’s books in the world. Run by a small team of dedicated book fans, they are almost as obsessed with publishing beautifully designed, beautifully produced books as we are! 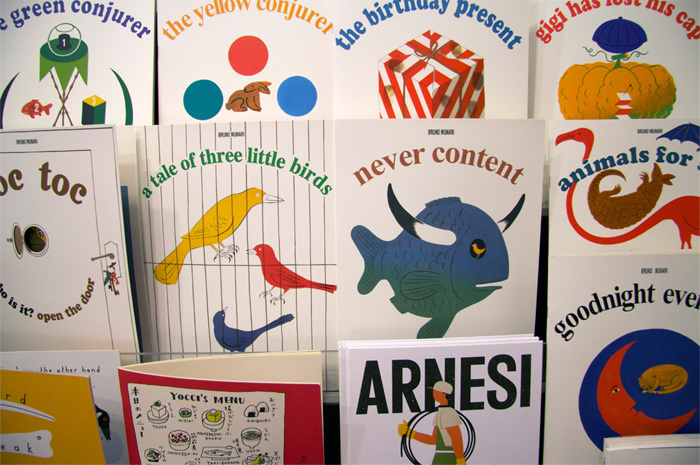 We currently have a selection of their wonderful books in our Great Eastern Street shop, so pop in and check them out. 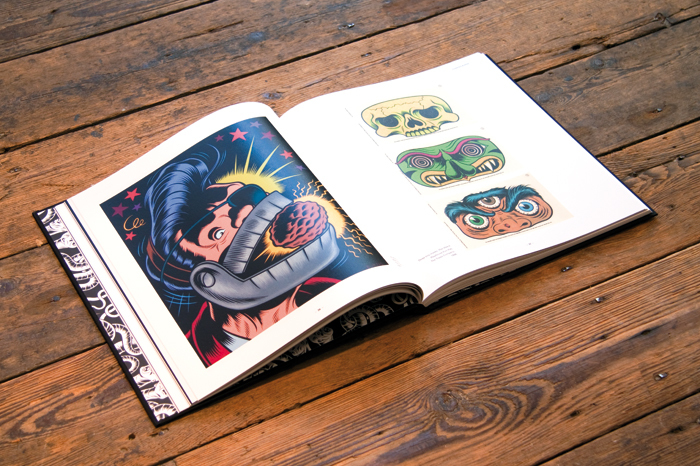 We’ve just acquired another unmissable exclusive here at the Nobrow shop. 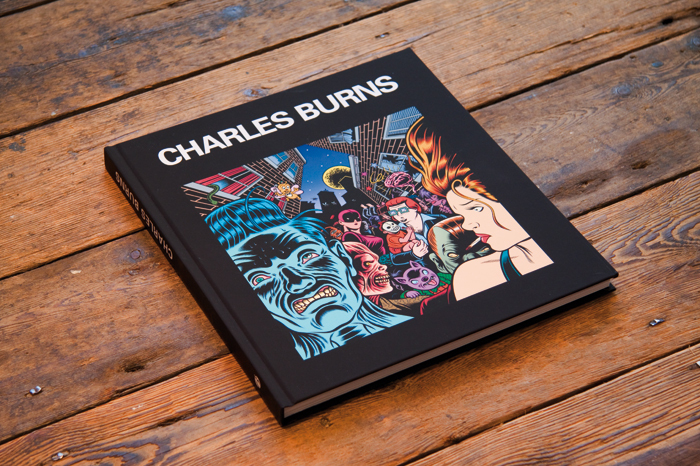 The beautifully designed and very cool M gallery in Leuven, Belgium has, until this past weekend, been hosting an exhibition of work by cartoonist Charles Burns (Black Hole), charting his career through not only his comics work but also his many album covers, magazine covers, photography, sketches and advertising work. To coincide with the exhibition, Beeld Beeld has published this very nicely put together catalogue of images from the show, all produced in full colour with an introduction by comics legend Joost Swarte, and we are very excited to have a bunch of copies in the store. We only have a limited number though and they’re only available at our Great Eastern Street store, so make sure you pop in soon if you don’t want to miss out!